Presented in the first person, the story is a collection of journal entries written by a woman whose physician husband has confined her to the upstairs bedroom of a house he has rented for the summer. She is forbidden from working and has to hide her journal from him, so she can recuperate from what he calls a "temporary nervous depression – a slight hysterical tendency," a diagnosis common to women in that period. The windows of the room are barred, and there is a gate across the top of the stairs, allowing her husband to control her access to the rest of the house. The story depicts the effect of confinement on the narrator's mental health and her descent into psychosis. With nothing to stimulate her, she becomes obsessed by the pattern and color of the wallpaper. 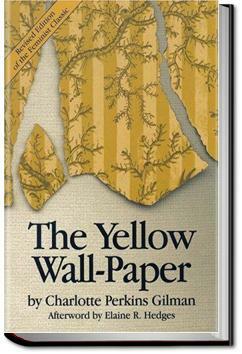 "It is the strangest yellow, that wall-paper! It makes me think of all the yellow things I ever saw – not beautiful ones like buttercups, but old foul, bad yellow things. But there is something else about that paper – the smell! ... The only thing I can think of that it is like is the color of the paper! A yellow smell." . . .ed enough to constantly irritate and provoke study, and when you follow the lame uncertain curves for a little distance they suddenly commit suicide—plunge off at outrageous angles, destroy themselves in unheard of contradictions. So, so good, the belittling and infantilizing treatment of this poor woman, and her entrapment in the room with the yellow wallpaper by her physician husband is a case history in how to drive someone completely insane. As always, amazing writing and stories that make you think. Gotta love Gilman, not only for her talent of writing, but her courage to write such feminist pieces during the 18th century. Wheeeeeeeeeeeeeeeeeeeeeeeeeeeeeeeeeeeeeeeeeeeeeeeeeeeeeeeeeeeeeeeeee! Yup, that was me enjoying the spiralling descent into madness. Roland Barthes talked about 'writerly' and 'readerly' books. I've struggled for a long time, myself, in trying to come up for terms to talk about the differences between deliberate works and those which are too bumbling, too one-sided, or too ill-informed to make the reader think.